The editor noted in the opening issue’s “Preliminary Note” that “It is regrattable that this paper cannot be definitely advertised as quarterly… the leisure required to organise and bring out a fresh number, at a stated time, is not always available (vii). It appeared irregularly. 100 – 150 pages in length. Most of the work in the magazines, including occasional photographs and drawings, were those of Wyndham Lewis. New York: Kraus Reprint Corporation, 1967. A review of art and literature, The Enemy was first published in the first quarter of 1927 and ran until 1929. Founder, editor, and primary contributor Wyndham Lewis hoped that his periodical, in keeping with its title, “secures for it this virtue: that it does not arrive under the misleading colours of friendship or of a universal benevolence” (Hoffman 283). In short, Lewis wanted The Enemy to challenge the social and cultural norms of his era, as many Modernists sought to do. Unlike many of these Modernist contemporaries, Lewis was a loner; he looked to distance himself from London’s avant-garde scene and with it, many of his former associates. Lewis used The Enemy to release his critical estimates of Henri Bergson, Sigmund Freud, James Joyce, Gertrude Stein, D. H. Lawrence, Sherwood Anderson, and others. He even used the magazine to engage in an extended literary battle with fellow little magazine, transition. “A MAN of understanding is to benefit by his enemies…. He that knoweth that he hath an enemy will look circumspectly about him to all matters, ordering his life and behaviour in better sort … therefore it was well and truly said of Antisthenes, that such men as would be saved and become honest ought of necessity to have either good friends or bitter enemies. But forasmuch as amity and friendship nowadays speaketh with a small and low voice, and is very audible and full of words in flattery, what remaineth but that we should hear the truth from the mouth of our enemies? Thine enemy, as thou knowest well enough, watcheth continually, spying and prying into all thine actions. As for our friends, it chanceth many times that they fall extreme sick, yea, and die while we defer and put off from day to day to go and visit them, or make small reckoning of them; but as touching our enemies we are so observant, we curiously enquire even after their very dreams. 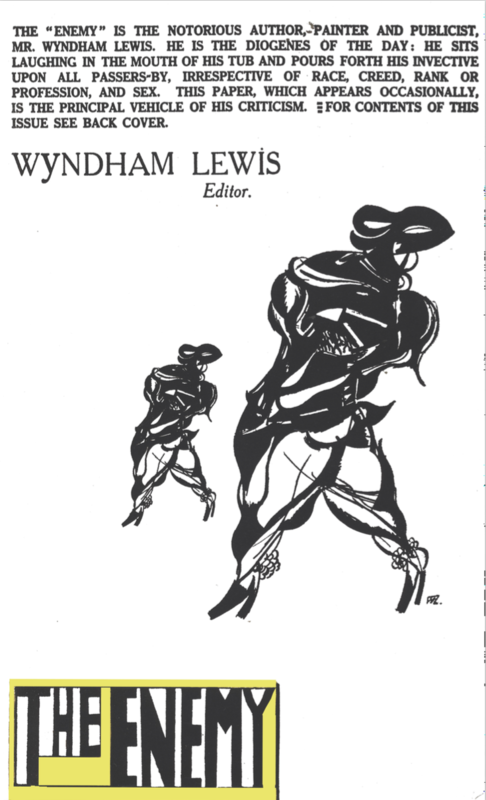 The following lines, printed on the front cover of Wyndham Lewis’ final issue of The Enemy, provide insight into both the magazine’s style and Lewis’ Enemy persona. The Enemy. 1:3 (Mar. 1929). Percy Wyndham Lewis, editor for BLAST‘s two-issue run and sole editor of The Enemy, was born in Amherst, Nova Scotia, Canada. Described as an “English Cubist” painter and writer, Lewis enjoyed a respected reputation among London’s young avant-garde and teamed with Ezra Pound in 1912 to form the Vorticist movement. Lewis published BLAST to explain the aesthetic theory and showcase the achievements of the “Anglo-Saxon Genius” of the Vorticists (Lewis, qtd. in Seshagiri 582). The short-lived movement died out after World War I and demand for Lewis’ art floundered as he shifted to studying political theory, philosophy, sociology, and anthropology (Cassidy 5). By the mid 1920s Lewis contributed frequently to a variety of modernist Littles and furiously published dozens of books and manifestos. In a 1922 issue of Criterion Lewis proclaimed his role as an adversary to those he labeled “amateurs”, “apes”, and “mock artists” who stole valuable studio space and column inches from “professionals” like him; a few weeks later, Lewis published again in Criterion to announce his new “Enemy” persona against such artistic imposters (Hanna 4). Five years later, Wyndham Lewis created The Enemy as a space for him to distance himself from the disdained avant-garde scene. Despite the scathing reviews he published in his magazine of such widely-acclaimed authors as James Joyce, Sherwood Anderson, and even Sigmund Freud, T. S. Eliot described Lewis as ”the most fascinating personality of our time…the most distinguished living novelist” (von der Ropp). Campbell, Sue Ellen. “The Enemy Opposite: The Outlaw Criticism of Wyndham Lewis.” Twentieth-Century Literary Criticism 104 (2001): 165-90. Cassidy, Victor. “Who Was Wyndham Lewis?” Twentieth-Century Literary Criticism 104 (2001): 26-38. The Enemy. 1927 – 1929. New York: Kraus Reprints, 1967. Hanna, Julian. “Blasting After Blast: Wyndham Lewis’ Late Manifestos.” Journal of Modern Literature 31 (2007): 124. Hoffman, Frederick J., Charles Allen, and Carolyn F. Ulrich. The Little Magazine: A History and a Bibliography. Princeton, NJ: Princeton UP, 1947. 283-84. Image, rollover. “The Enemy 1: A Review of Art and Literature (Jan 1927).” Ginko Press. 23 July 2009. Pound, Omar, and Philip Grover. Wyndham Lewis: A Descriptive Bibliography. Kent: Wm Dawson & Sons Ltd, 1978. 85-90. Seshagiri, Urmila. “Racial Politics, Modernist Poetics.” Modernism: A Comparative History of Literature in European Languages. Astradur Eysteinsson and Vivian Liska, eds. Philadelphia: John Benjamins Publishing Co., 2007. 582.